The round brilliant diamond is the most popular diamond shape and, because of the laws of supply and demand, is the generally the most expensive. 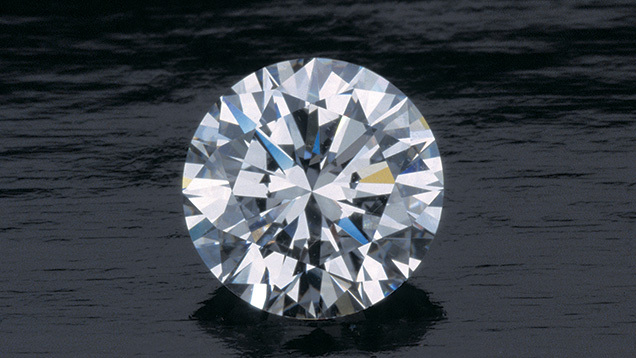 Even with modern techniques, the cutting and polishing of a diamond crystal always results in a dramatic loss of weight; rarely is it less than 50%. The round brilliant cut is preferred when the crystal is an octahedron, as often two stones may be cut from one such crystal. There are 58 facets in a Round Brilliant Cut including the culet. On the Crown or upper part of the Diamond, these consist of 1 table facet, 8 bezel facets, 8 star facets, and 16 upper girdle facets for a total of 33. On the pavilion, or bottom part of the Diamond, there are 16 lower girdle facets, 8 pavilion main facets and 1 culet. If the pavilion comes to a point at the bottom, the diamond does not have a culet. 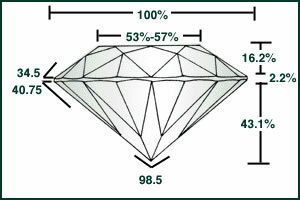 Most round brilliant diamonds have roughly the same girdle thickness at all 16 “thick parts”.